For other uses, see Junius Spencer Morgan (disambiguation). Cedar Hill Cemetery, Hartford, Connecticut, U.S.
Junius Spencer Morgan I (April 14, 1813 – April 8, 1890) was an American banker and financier as well as the father of J. P. Morgan. He founded J. S. Morgan & Co. along with George Peabody. Morgan was born on April 14, 1813 in Holyoke, Massachusetts. The Morgan name is traced to Carmarthen, Wales, with his earliest known ancestor being Hyfaidd ap Bleddri, third son of Bledri of Wales. Miles Morgan, ancestor to the Morgan family in America, emigrated from Bristol, England to Boston in 1636. His sister, Lucy Morgan (d. 1890) was married to Major James Goodwin, one of the founders, and a president for many years, of the Connecticut Mutual Life Insurance Company. Lucy was the mother of James J. Goodwin and the Rev. Francis Goodwin, chairman of the Hartford Parks Commission. 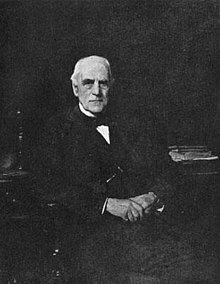 Main article: J. S. Morgan & Co.
Morgan began his business career in 1829 by entering the employ of Alfred Welles of Boston. He had inherited wealth from his father, Joseph Morgan, and showed great business ability. He was soon invited to become a partner in the house of J. M. Beebe & Co., one of the largest retail stores in Boston and one of the largest dry goods importing and jobbing houses in the country. He was in the dry goods business from about 1836 to 1853. After some years, he met George Peabody, the well-known London banker. Shortly after the meeting, in 1854, Morgan entered Peabody's prosperous firm, George Peabody & Co. as a partner. Ten years later, in 1864, Morgan succeeded Peabody as head of the firm and changed its name to J. S. Morgan & Co.
During the American Civil War, the firm was a seller of United States war bonds in England. With the assistance of his son, J. P. Morgan, who used the cables system to telegraph the outcomes of battles prior to their general knowledge in England, Junius was able to buy low and sell high. "...never do anything to cause evil to be spoken of the American name." Mary Lyman Morgan (1844–1919), who married Walter Hayes Burns (1838–1897). Their daughter, Mary Ethel Burns (d. 1961) married Lewis Harcourt, 1st Viscount Harcourt (1863–1922) in 1899. Juliet Pierpont Morgan (1847–1923), who was the mother of John Junius Morgan (d. 1952). He contributed money to the Hartford Free Library, his church and to Trinity College, Hartford. Morgan died on April 8, 1890, from injuries sustained in a carriage accident. At his funeral, the pallbearers were Roland Mather, Levi P. Morton, Anthony Joseph Drexel, Chauncey M. Depew, Cornelius Vanderbilt II, J. C. Rogers, J. Kearney Warren, and Edward John Phelps. He was interred at the family lot in Cedar Hill Cemetery. At his death, he left a fortune estimated at about $10,000,000 (equivalent to $278,851,852 today). ^ Genealogical and family history of the state of New Hampshire: a record of the achievements of her people in the making of a commonwealth and the founding of a nation, Volume 1. Lewis Publishing Company. 1908. p. 56. ^ "MRS. LUCY MORGAN GOODWIN'S ESTATES". The New York Times. 26 October 1890. Retrieved 23 February 2017. ^ a b c d "J.S MORGAN'S DEATH. ; THE RESULT OF THE BANKER'S RECENT ACCIDENT AT MONTE CARLO". The New York Times. 9 April 1890. Retrieved 23 February 2017. ^ Samuel Atkins Eliot, Heralds of a liberal faith, Volume 2, American Unitarian Association, 1910, p. 185. ^ Witzel, Morgan (2003). Fifty Key Figures in Management. Routledge. p. 207. Retrieved September 21, 2015. ^ J.P. Morgan's Way. Pearson Education. 2010. p. 2. Retrieved September 21, 2015. ^ Times, Special To The New York (21 November 1924). "MRS. MORGAN'S FUNERAL. ; Services to Be Held Today at Highland Falls and Here on Sunday". The New York Times. Retrieved 23 February 2017. ^ "J. S. MORGAN DIES IN SWITZERLAND; Retired Banker Emulated Ex- ample of Uncle, the Late j. P., as Art Collector. HONORED BY TWO NATIONS Spent Most of Time in Europe Since Retiring From Paris Banking Firm Many Years Ago". The New York Times. 19 August 1932. Retrieved 4 March 2017. ^ "Oxford Dictionary of National Biography". Oxforddnb.com. Retrieved 30 August 2013. ^ "MRS. JULIET MORGAN LEFT ONLY $43,738; Sister of Late J.P. Morgan Made No Will, and All Goes to Son". The New York Times. 29 December 1923. Retrieved 23 February 2017. ^ Times, Special To The New York (19 July 1952). "MORGAN ESTATE TAX FILED; Cousin of Late Banker Had Net of $1,881,913, Appraisal Shows". The New York Times. Retrieved 23 February 2017. ^ "HARTFORD'S FREE LIBRARY". The New York Times. 1 April 1890. Retrieved 23 February 2017. ^ Gilman, D. C.; Peck, H. T.; Colby, F. M., eds. (1905). "Morgan, Junius Spenser" . New International Encyclopedia (1st ed.). New York: Dodd, Mead. ^ "J.S. MORGAN'S DEATH". The New York Times. 10 April 1890. p. 1. Retrieved 23 February 2017. ^ "FUNERAL OF JUNIUS S. MORGAN". The New York Times. 7 May 1890. Retrieved 23 February 2017. ^ "THE LATE JUNIUS S. MORGAN. ; HIS BODY WILL BE INTERRED IN CEDAR HILL CEMETERY, HARTFORD". The New York Times. 26 April 1890. Retrieved 23 February 2017. Banca Commerciale Italiana Trust Co.
H. F. Ahmanson & Co.